A Brill international peer-reviewed journal that covers both new and traditional aspects of the study of language change. 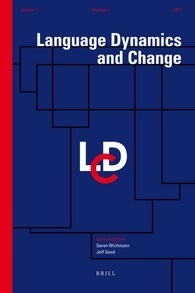 Language Dynamics and Change (LDC) is an international peer-reviewed journal that covers both new and traditional aspects of the study of language change. Work on any language or language family is welcomed, as long as it bears on topics that are also of theoretical interest. A particular focus is on new developments in the field arising from the accumulation of extensive databases of dialect variation and typological distributions, spoken corpora, parallel texts, and comparative lexicons, which allow for the application of new types of quantitative approaches to diachronic linguistics. Moreover, the journal will serve as an outlet for increasingly important interdisciplinary work on such topics as the evolution of language, archaeology and linguistics (‘archaeolinguistics’), human genetic and linguistic prehistory, and the computational modeling of language dynamics.